First of all, thank you to every single person who has contributed already to the Mandalas for Marinke collaborative crochet art project, designed to raise awareness about depression and mental health issues while celebrating the creative work (and mandala patterns) of Wink who succumbed to suicide earlier this summer. The project has received more than 150 contributions from over than 30 states and about 20 countries. It’s amazing to see the love pouring in. Each mandala will be shared here on the blog in daily posts with Words from Wink and depression awareness information. Eventually it will all come together into an art show and art book; seven of her family members have expressed an interest in a copy of this book and I will be so happy to be able to gift those when the project reaches that stage. Today I am announcing a DEADLINE EXTENSION and some other updates. When I first started this project in early July, I requested that all mandalas be postmarked by August 31st. I figured that this would mean they’d all arrive by mid-September and I’ve been glad to see so many come in. It gives me a really great idea of what size and type of space I’ll need for the art show. Now that the deadline is approaching, I am able to see that an extension would be of benefit to some people and wouldn’t harm the project’s progress in any way so I am able to offer that extension. Several people have already requested private extensions (not a problem at all) so I’m able to see that folks are interested in participating and haven’t had a chance yet. The more contributions, the more awareness we raise, the better. The current issue of Simply Crochet magazine just published an announcement about the project in Issue 35. 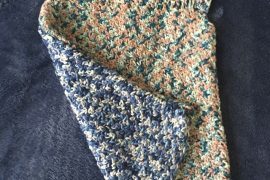 I also have articles coming out in the next issues of Happily Hooked magazine and Interweave Crochet! magazine, both of which mention the project. I am so grateful that people are sharing the project and Wink’s work! I want to make sure that anyone who first becomes aware of the project through these channels has ample time to participate. The art show likely won’t take place until early 2016 anyway. Originally I wasn’t sure if it would be a late 2015 show or early 2016. Looking at the available options, it seems that most places are booked out through the holidays so the show is unlikely to take place until 2016, which is totally okay. That means that I can extend the deadline a little without impacting the trajectory of the art show. Originally, I shared an intention that a portion of the sales from the art book would go to a related organization. After extensive research into the available options, I’ve got an idea of the direction that this is going to go. I need to do some more groundwork before I make a big announcement about this but for now I’ll share that it is going to take a bit more time to put all of the steps in place for it so the extension makes perfect sense in this area as well. Already contributed and want to send more? That’s absolutely fine. Send them along! 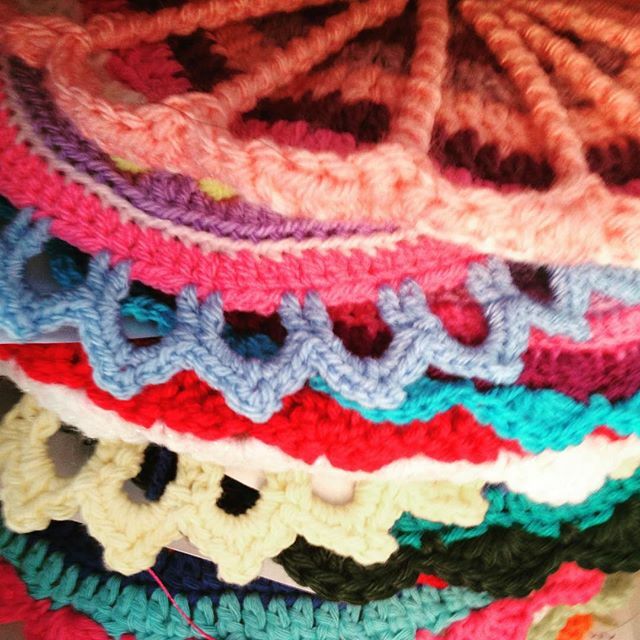 Lots of mini crochet mandalas. 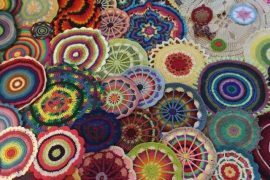 Mandalas made of any thread or yarn that are around 3″ – 6″ in diameter. As many as you can create! 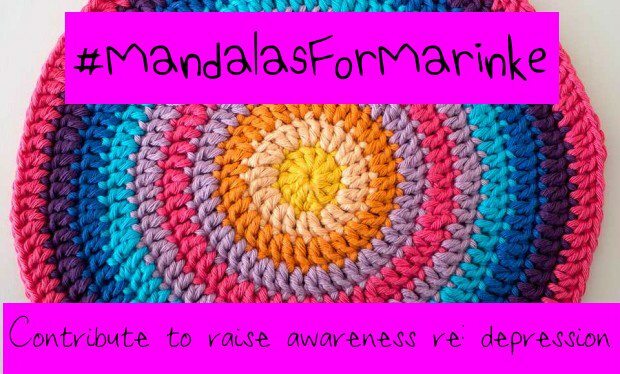 The idea behind these is that anyone can take a small mandala with them wherever they go, in a wallet or a purse, so they can be gifted to people who feel that they need that ongoing support, used by people who wish to yarn bomb the Mandalas for Marinke message, etc. 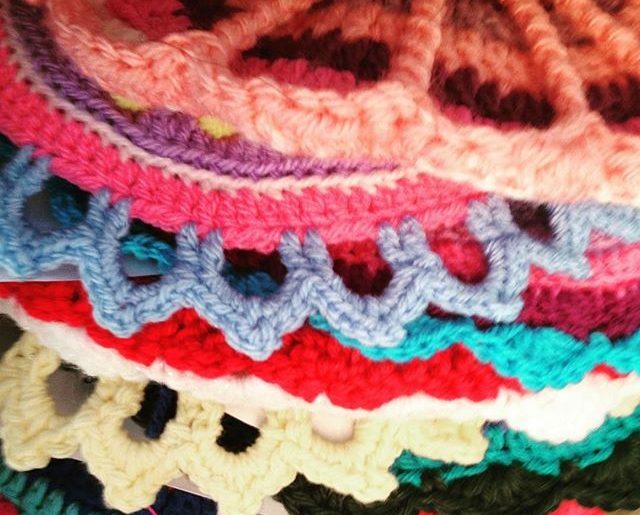 Huge, cozy crochet mandala rugs. I’ll be creating a space at the art show where people can learn crochet and craft together and I want it to be as comfy as possible. I’ll be crafting big mandala rugs myself for the project but if anyone feels compelled to create some and send them to the project, they’d be hugely appreciated and well used! Crochet mandalas made out of alternative materials. I love every contribution that’s come in made with thread and yarn and those are always, always welcome. But I’d love to represent other materials as well so if you’re someone who crochets with plastic bags, t-shirt yarn, fabric remnants, wire, beads or any other material and you want to contribute, I want what you want to send! Other details and FAQ about the project can be found here. Thank you for the up-date. Will try to get mine sent along before I miss the dead-line. So much going on and so little time to get everything done. This is a great project and am pleased to be a part of it. Thanks for the extension. I really want to participate in this but I also have horrible horrible depression which makes everything seem a lot harder and overwhelming. I was thinking about doing a mini one actually so it would be cool to see what other people come up with. I really like her coaster pattern because it’s the same sort of idea but less rows with a nice border. I totally understand what it’s like to have depression getting the best of you even when you really want to do something. Take your time. Whatever you send will be perfect! Thanks for extending the deadline. I wanted to participate, but wouldn’t be able to afford it until September. Now I just hope my depression doesn’t get in the way as well. I am actually making a number of smaller mandalas to send. I’m not sure how many I will get made. Can I send them as I get them made or do you want me to wait until closer to the deadline and send all that I think I’m going to get done. I am hoping to get a large one done, as well. I have 4 smaller and 1 medium made at this point. Thanks for coordinating this project. You can send them however you’d like – all together or in smaller packages. Absolutely whatever you want to do is fine. Thank you so much for your contribution! Thanks. Did another 6″ one today in thread. I’m shooting for that size and smaller. I’ll probably try to get some in the mail next week. Sounds so great. Thank you! Oh I am so happy now to find out that the deadline is extended! I have so much wanted to contribute to this project, but I haven´t been able to yet. I am also limited because of depression and also severe pain in my body, so it hasn´t been possible yet for me to create a mandala. 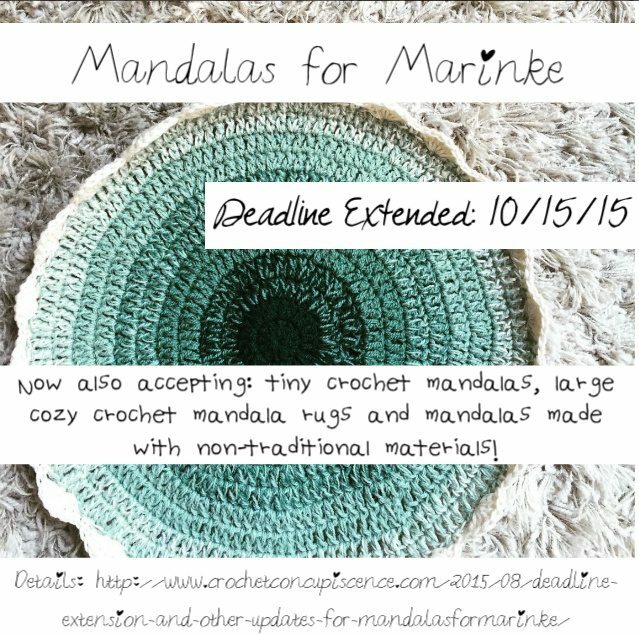 So I am happy that this means I have more time and I will try and really hope I will be able to send atleast one mandala. 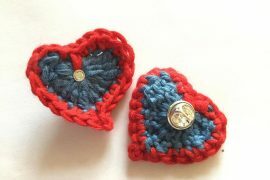 I love to crochet and it really helps with healing, and it is so important this project for so many people, including me. To honour Wink and to raise awareness about depression. So thank you for everything you do for this project, and also for extending the deadline. I am very happy to see you have extended the deadline. My mandala has been ready for quite some time now, what isn’t ready is the write up you requested, trying to figure out how to balance respect for my family and telling a ‘family secret’. Perhaps while I’m figuring that out I’ll make a small mandala from crochet thread…. Totally understand that! Please feel free to take your time with the writing. When it comes, it will be perfect. Let me know if you need any help working on it. HUGS.